, Picasso Tiles, and Magnetic Stick n Stack. 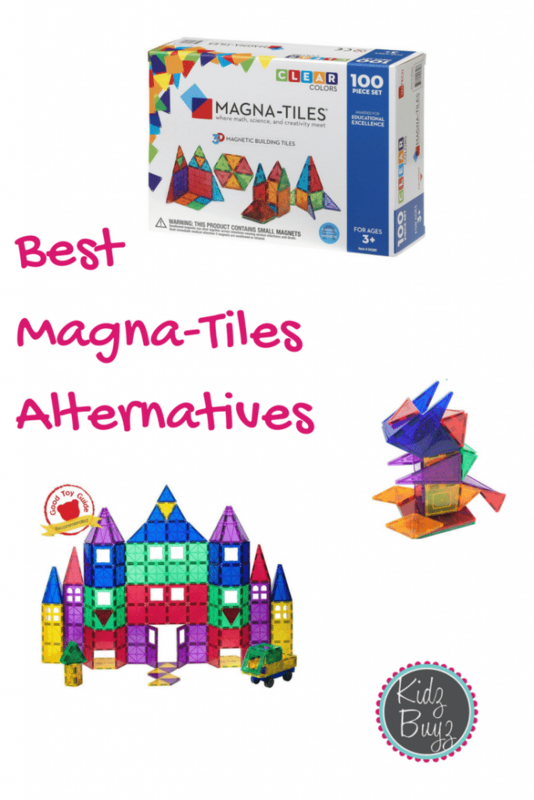 As mentioned above, Magna-Tiles has been the leading magnetic tile brand for years. There’s no denying that, in most cases, your kids will get a lot of play out of them, so you definitely want to be sure to buy a brand that will hold up to play and that has good magnet strength (easier for kids to build and fewer collapses). As you’ll notice from the picture above, they all look similar, some have more creative options. – it is a great addition to any tile set! Picasso Tiles are also a good alternative, but tend to be a little pricier than Playmags (promos vary). From a quality standpoint, they are similar in look and feel, the most noticeable difference is that the colors vary a bit. The magnets are as strong as Magna-Tiles. We have both and I do not notice a discernible difference. The key benefit again is cost. If you have multiple kids, you will want at least 100 tiles/per kid, unless you are looking for arguments over the tiles. I think we have about 300 total. Picasso Tiles generally sell for about $64.99 for 100 tiles ($0.64/tile). Compared to $1.20/tile for Magna-Tiles, you have to ask yourself if the Magna-Tiles are that much better. In my opinion, they are not. When cost is a consideration, I recommend Picasso Tiles as a base set. Your kids won’t know the difference. While they sometimes pop up on Zulily, Amazon generally has the best prices. Picasso Tiles also makes a vehicle set (a steal at around $10) and an accessory set with windows and doors (which Magna-Tiles does not currently offer). Magnetic Stick n Stack are a definite step down. The primary reason is that their magnet strength is not as strong as either Magna-Tiles, Playmags or Picasso Tiles. In addition, they are lighter and the plastic seems thinner. We have accessory sets from both brands and they are fine with a stronger base set, but I would not get them as the primary set. For $7, the increase in quality from Picasso wins. Magnetic Stick n Stack also sells 100 pieces for $69.99. The benefit of Magnetic Stick n Stack is that they do offer a wider variety of pieces. But for me, when buying a main set, that does not outweigh the quality that Picasso and Playmags offer. While I don’t recommend this or other random brands as a main set, they do have some cool and unique accessory sets (which is what we have). It’s a cost effective way to add on to Magna-Tiles, Playmags or Picasso Tiles. Here are some of the accessory sets that we have. Always be sure to scroll down in an item and check the special promotions section. Both brands often have promo codes for additional savings (though the prices bounce around too). Are Magna-Tiles the best? Or should I go with a Magna-Tiles alternative? Over the past year, we have seen quite a bit of improvement in Magna-Tile Alternatives. In the past there were seldom sales on Magna-Tiles. Now, we are frequently seeing them on Zulily! Even on sale though, they do not get down to the price level of Playmags and Picasso Tiles. You can get nearly twice as many tiles for the same price as one set of Magna-Tiles and both brands are high quality, with great magnetic strength and more specialty options. Check Zulily for Playmags here. Check Zulily for Picasso Tiles here. Check Zulily for Magna-Tiles here. Previous Post Magna-Tiles vs Magformers (And Tegu too)! Next Post Expired: Tea Collection Secret Sample Sale! 65% off!!! These are cute! The Amazon Exclusive Mega-Pack is down to $27.99. They also sell them in singles. Who has these? How are they? My kids loved these. The mags pack is great. It would be a fun summer activity or party activity. Ordered! Looks like a fun activity to keep my daughter entertained! We have these. My daughter got them for her birthday in December and still plays with them! It’s an awesome activity for her to do at the table when I’m getting dinner ready or packing lunches! We got the mega pack for Christmas. My 4 yr old loves it. They don’t always come completely back to white. It depends on how long you leave the marker on them and also I found that a warm rinse with a kitchen sprayer helps get it off when you’re done playing with them. This is the kind of toy I would have played with for HOURS as a child. I was actually glad it didn’t get hyped up last year. Made it easy to find! Even my little bit older kids had fun with these and the bathtub is perfect for lol dolls too. The mega pack is way, way cheaper than the small packs in the store. My daughter (3.5) loves these. My almost 5 year old boy loves these!! Adrienne Morey Jenkins. Is this the one she has?